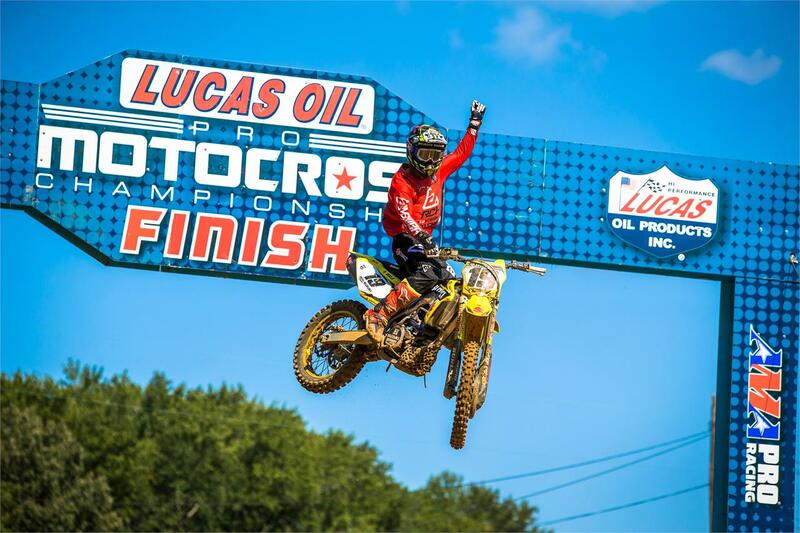 RCH Yoshimura Suzuki Factory Racing’s Justin Bogle collected his first career AMA Lucas Oil Pro Motocross Championship victory riding the team’s RM-Z450 at the weekend’s Budds Creek National in America. Bogle, who moved to Tallahassee, Florida earlier this year to re-tool his training and riding programs, was a staple at the front of the field in both motos and never raced deeper than third in the running order. His win also marked the first chequered flag for the defending 450 Class champions this season and first since Ken Roczen closed-out last year with a 1-1 finish at the Ironman National. Bogle’s RCH teammate Matt Bisceglia had a career day of his own by collecting both premier 450 Class Holeshot Awards and logging a 6-10 finish to bring his RM-Z450 home eighth in the final rundown. The curtain rings down on 2017 Saturday afternoon when the teams and riders of the Lucas Oil Pro Motocross Championship visit Crawfordsville, for the 12th and final race of the year. Weston Peick took his Suzuki RM-Z450 to eighth place in the first moto, then switched-up his lines for the second moto and for sixth. His 8-6 moto scores netted him sixth overall and he sits eighth in the standings with one round to go. Phil Nicoletti continued to get used to the race pace after being out for the better part of a year. Nicoletti’s 14-12 scores resulted in a 13th place overall finish.